Biography: Melanie Florence is a writer of Cree and Scottish heritage based in Toronto. She was close to her grandfather as a child, a relationship that sparked her interest in writing about Indigenous themes and characters. She is the author of Missing Nimama, which won the 2016 TD Canadian Children's Literature Award and is a Forest of Reading Golden Oak Finalist. 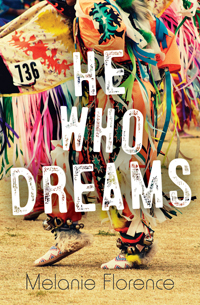 Her other books include Righting Canada's Wrongs: Residential Schools and the teen novels He Who Dreams, The Missing, One Night, and Rez Runaway. In her spare time, Melanie watches Doctor Who and Harry Potter with her daughter, discusses the DC vs Marvel Universes with her son and makes her husband sit through scary movies with her. She shares her home with her family, their two dogs (Henry and Daisy), two cats (Shadow and Oreo), an ever-increasing number of aquarium creatures...and according to her daughter, a house elf who refuses to help with chores. For more information, visit www.melanieflorence.com. The sound of the drumbeats changes everything.